Do you want to use an English keyboard which matches the Hebrew phonetically? Or do you prefer an Israeli keyboard? Should the shift state serve to provide final forms or doubled forms? Where do the vowel points go? Try to match them with English phonetically? Or put them all on special keys (123...)? Where is the aleph key? (I'm always searching for it if it's not on the "a".) Or the vav/waw? Or the het or tet? The idea here is that your operating system understands that you want to type in Hebrew and switches to a Hebrew keyboard and a Unicode Hebrew font using right-to-left formatting. (For Windows users, at least, this is going to mean enabling a buried regional parameter to allow the right-to-left typing.) 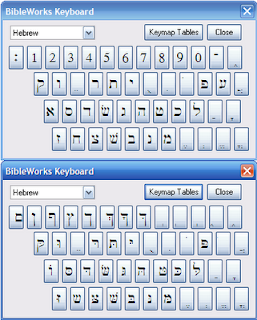 Do note that most English users are not going to want to use an Israeli keyboard but rather one that is laid out for an English keyboard and optimized for biblical Hebrew needs. 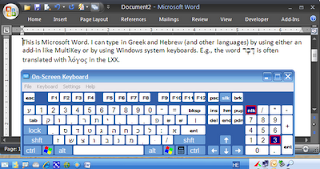 An advantage in using a Windows system keyboard is that you also can use the onscreen keyboard which is included for free. (It is part of the accessibility options in Windows. For WinXP see here or here and for Win7 see here. [HT: bkMitchell]) What about Macs? I don't have much experience with Macs, but I have noted some solutions below. 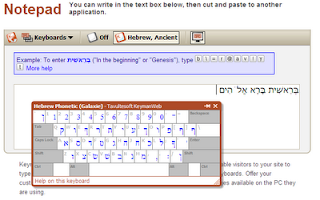 Another excellent way to type in Hebrew (and other languages) is Tavultesoft's Keyman program. (Pricing is $19 for 2 keyboards. 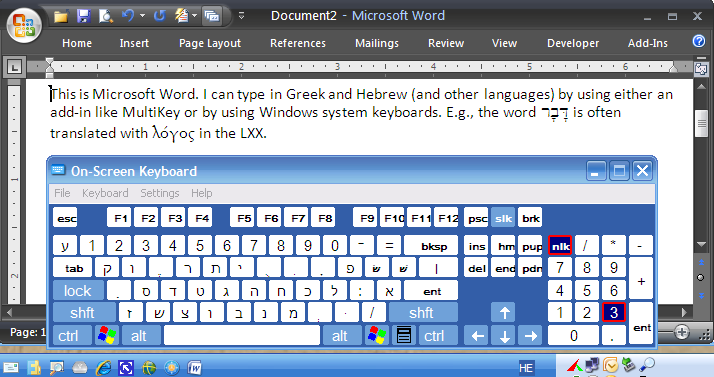 Windows only) Once you have the program, then get Galaxie's BibleScript Greek and Hebrew Keyboard. (Here is a PDF of the installation manual and keyboard layouts.) As you can see in the graphic above, the shift state is used for doubling and most of the vowels are on the shifted number row. It's a bit of a trick finding the final form. A nice feature is that it does include a pop-up keyboard if you need help. 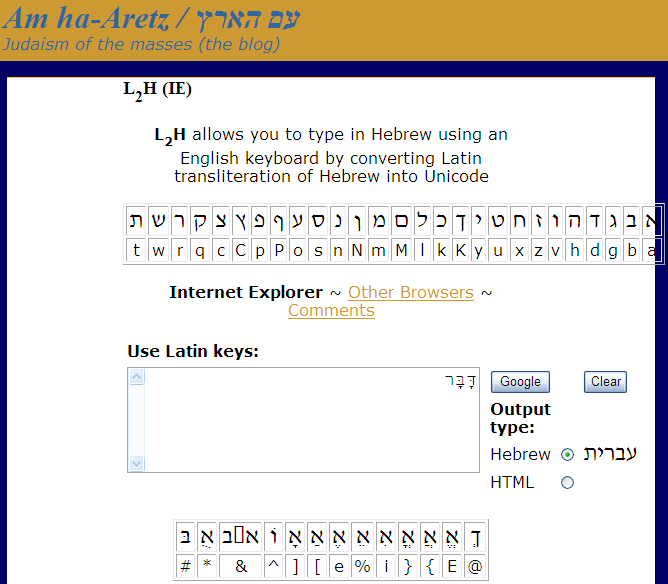 In addition to the fine SBL Hebrew font, SBL also provides Hebrew keyboards. Here is the SIL keyboard manual. It's mainly phonetically based, but the aleph and ayin are on the shifted angle brackets, and you'll find the het on the "x" and the tet on the "v". 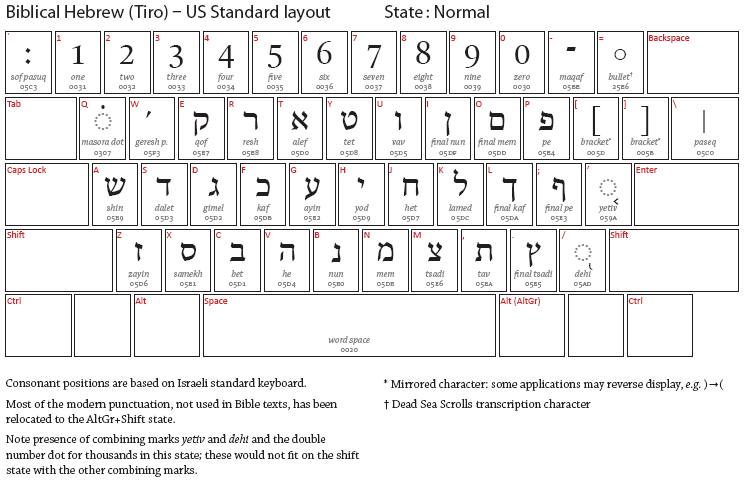 SBL also provides a Tiro Hebrew keyboard. Here is the Tiro keyboard manual. It's mainly based on the Israeli standard keyboard, so it is probably not a preferred keyboard for those not familiar with that layout. Don't like a keyboard layout? Tyndale provides some instructions for changing the layout using SIL's Ukelele program for the Mac or the Microsoft Keyboard Layout Creator for Windows. 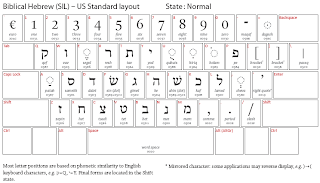 Basically these allow you to assign Unicode characters to keystrokes, but matters are complicated with Hebrew (and Greek) because you will want to add vowels and accents and such and have the keyboard reference the proper precombined character. You will probably want to get familiar with BabelMap which is a great free Unicode character mapping program for Windows. Here is a good place to start for some basic information on installing and using a Hebrew keyboard. Info is given on how to activate the Keyboard Viewer. 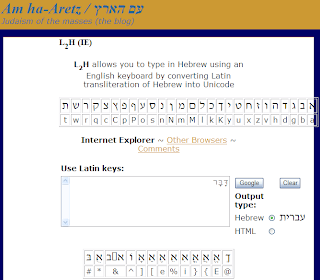 Instead of using the standard Hebrew keyboard layout, it is recommended that you use the Hebrew QWERTY keyboard displayed above. 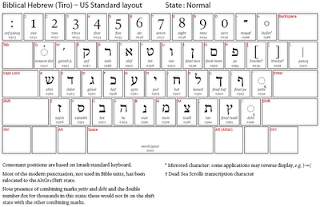 SBL provides Hebrew keyboard Drivers for SIL and Tiro (OS X) Cf. graphics above for these keyboards. Bill / Ze'ev Clementson provides his own well-considered Hebrew-ZC Keyboard. It's well-considered, because he has tried to incorporate the best of both the SIL and Tiro keyboards as well as frequency of Hebrew character and vowel stats. The keyboard download, installation instructions, and layout diagrams are on that page. Shibboleth is a tool for typing Unicode text in ancient scripts. It was designed to help people unfamiliar with a script easily enter the correct characters, and then copy text to the clipboard in Unicode or another format. While a keyboard layout is provided for several scripts, the emphasis is on helping the user recognize and select the proper characters. To that end, user input is shown in both typed and rendered format, with multiple font options, and all of the characters for each script are selectable from a well organized palette on the right side of the application window. Note also that Shibboleth does require Microsoft's .NET Framework 4 Client to run. Also available on the download page are other fonts you can install to use your output in other applications. Keyman Web is a free, online notepad from Tavultesoft for typing in just about any language and then copy/paste into your document. 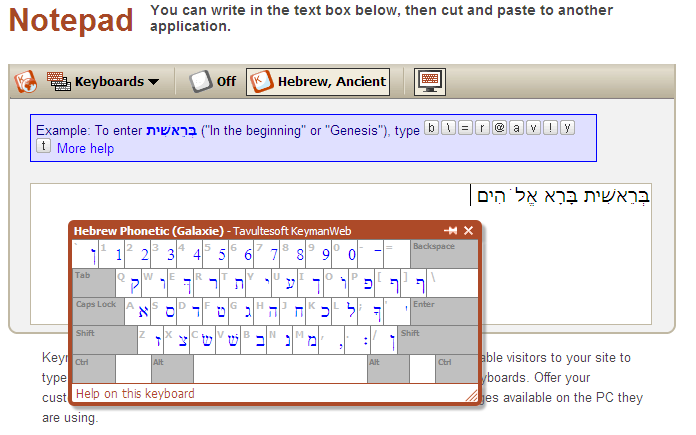 For Hebrew, you can choose to use the Galaxie Hebrew keyboard described above as part of the Tavultesoft Keyman program. As you can see in the graphic, you can activate an onscreen keyboard. (But it won't show you all the vowels on the shift state.) You can see that the אֱלֹהִים doesn't look correctly spaced, but when you paste it into your word processor, it will be fine. Now only available on Internet Archive, Am ha-Aretz is another notepad type of online app that allows you to type / copy / paste. There is an Internet Explorer version that works well and an "other browser" version that works with Firefox but not very well. Another option is to use a word processor that is designed for scholarly work that requires a variety of fonts including a mix of left-to-right and right-to-left languages. 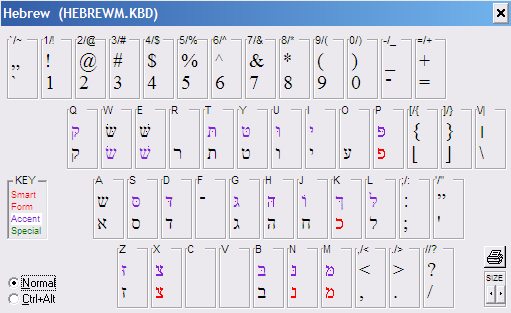 Nota Bene Lingua is much more than a word processor, but it is incredibly easy to use for typing in Hebrew and handles mixing typing direction well. It has popup keyboards and smart characters that automatically convert to final forms as you type where appropriate. It uses a largely phonetic layout, but vowels are accessed through using F6 and then selecting the one you want. "Mellel is the leading word processor for Mac OS X designed especially for creative and technical writing, scholars and anyone who wants a reliable word processor." 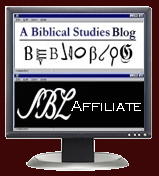 "If right-to-left languages, or languages related to biblical studies are important to your work, Mellel is probably what you need." Classical Text Editor is "the word-processor for critical editions, commentaries and parallel texts..." Allows for any number of notes and apparatus, bidirectional text. Created by Stefan Hagel. (Cf. MultiKey above) For Windows and Macintosh with emulated Windows. As indicated in the comments, Nisus Writer Pro (Mac) reportedly does well with right to left fonts and NeoOffice (Mac) is also usable. OpenOffice (Windows, Mac, Linux) is also an excellent choice. I have no experience with Unitype, but you can buy this program (starting at $150USD) as part of either the standalone Global Writer or Global Office which integrates with MS Word. 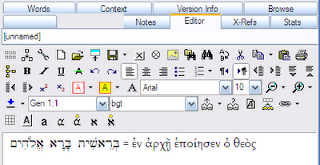 Antioch "is a utility which allows you to type classical Greek and Hebrew in Word. It includes fully programmable Greek and Hebrew keyboards, a uniquely simple and flexible system for handling diacritics and vowel points, an elegant font with all necessary characters, and converters for documents in many other formats." It works with all versions of MS Word (including 2010) for Windows. Vowels are on the number row and also on the keypad. It allows for personalization of the characters. Cost is US$50. If you have one of the major Bible software programs, you can use their built-in editors and then copy/paste into other applications or documents. Accordance provides a good explanation of font usage in this PDF file. 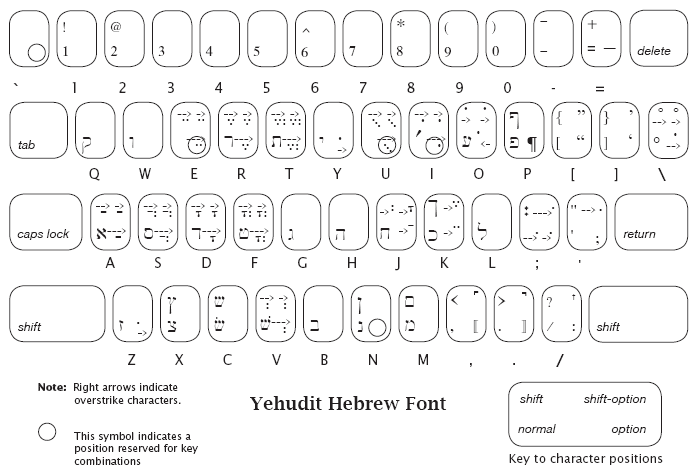 The font used for Hebrew is Yehudit. Keyboard diagrams are provided. Accordance does not actually use Unicode, but it can export Unicode. BibleWorks has a rather robust editor that allows for typing either in its own BWHEBB font (shown above) or in Unicode. 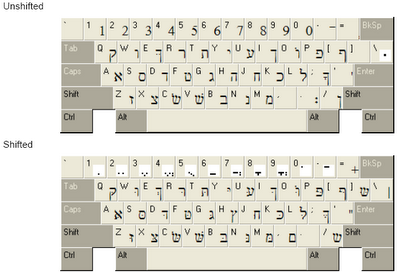 (When using the Unicode Hebrew, it actually uses the Hebrew system keyboard you have installed.) The 'busy' buttonbar shown can be simplified, and the editing works for both the editor and chapter/verse notes entries. The files are actually RTF files, so you could do your work in the editor and then open the file in your word processor. Logos works entirely with Unicode, so anything you type will use the system keyboard you have installed (cf. the choices above), and you can easily copy/paste text into documents outside Logos in full Unicode beauty. Well... pulling this info together took way longer than I anticipated, but I am gearing up for a writing project that does involve a lot of Hebrew, and so I wanted to get myself properly situated. For that project, I may try to do everything in Nota Bene. 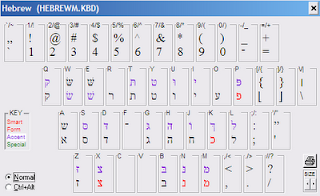 For now, I've been using the Logos Hebrew keyboard in MSWord and also in the BibleWorks editor. When I've gotten frustrated with finding vowels or other markings, I've pulled up Shibboleth. Keyman Web is another quick option, and I am considering whether I should go ahead and buy the Keyman Desktop program, since it really does the best job with polytonic Greek. 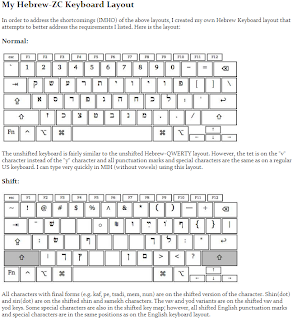 I've provided graphics of the keyboard layouts, because that really is the most important factor. At least now you know many of your choices, but I have to suppose I've missed other options out there. Please post a comment on your preferred way of typing Hebrew, and I will try to update this entry. Thanks. You have already hit on the set I use. 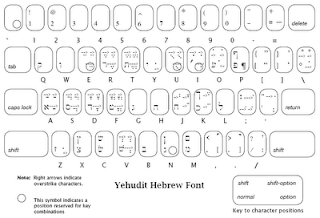 I use the Israeli Keyboard layout and the word processor I use is Mellel. I have heard that Nisus Writer Pro also does well with right to left fonts. NeoOffice does okay. But Mellel is by far the best I have used. Word does not work at all on a Mac and Pages can also be kind of a nightmare. I can't praise Mellel enough. It works flawlessly on typing for a mac. I also type a bit in Akkadian and other Semitic languages, and Mac has this great U.S. Extended keyboard setting, that allows for all of the funky diacritics that one might need. Command+space and I can toggle through all my options. I may be kind of old school, but my favorite font for Hebrew is times new roman. And if you need any help you can open up the keyboard layout through the international menu. One of the advantages for using the Israeli keyboard layout is that it is (or can be set as) universal: iPhone, Accordance, and all other text editing windows. Even Blogger! 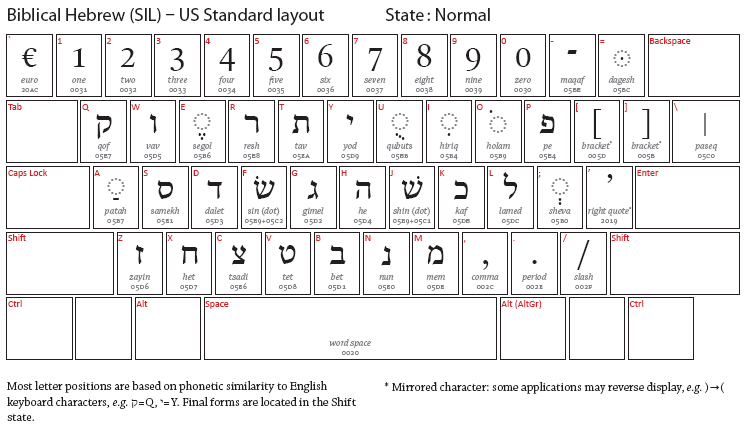 Excellent summary of the available Hebrew keyboard options. Thanks for linking to and commenting about my 2 pages as well. 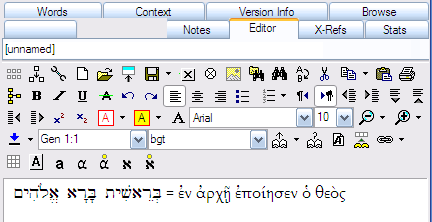 OpenOffice.org does a good job with right-to-left and Hebrew too. I hesitate to mention the first product because it is pretty expensive but it is so convenient! 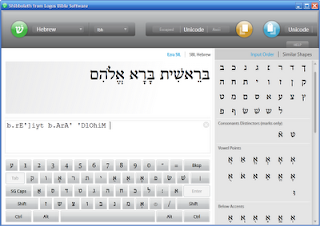 You can open any Hebrew Text document and it automatically adds the vowels for you. The second product is cheaper and fully unicode compliant. OVER 300,000 Nikud word Dictionary! 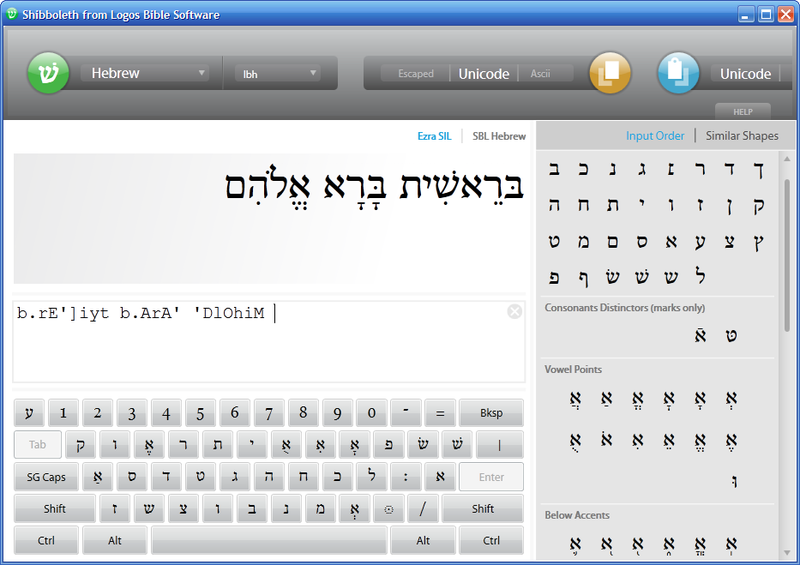 The best Hebrew-English Wordprocessor just got (MUCH) better! New Features PLUS Now you can edit and Print your own Siddur or any part of the Siddur! Plus add Clipart to your documents from a library of over 10,000 Graphics. Just some of the new features: Wrap around graphics, background graphics, split and merge cells in tables, Cantillation Marks (trop), Automatic nikud with user-adjustable nikud location, Microsoft Word filter, Save to HTML, Horizontal and Vertical Rulers, 600 New Templates, Interactive real-time spell-checking (as you type! )...PLUS new Windows XP interface, many more new features and enhancements! Dagesh... The easiest and fastest word processor... is an amazing program. Its my recommendation for the Windows environment. The latest version of Shibboleth includes an RTF copy mode which doesn't include the XML language tags but does include the Rich Text font information, so you can directly copy into Word (or Logos, your favorite web browser or any other Unicode application) without having to delete tags. You may still wish to tweak the font size, since the tool makes no assumptions about what size you want to copy out. The placement of the aleph on ' and the ayin on " and ` isn't a break in the phonetic layout, since these are glottal stops and those are common ways to transliterate those stops (there being no standard keys for the half rings used in much scholarly literature). An aleph isn't an 'a', for example. There is no 'a' in 'elohim. I think the real ease of the Logos layout is the placement of the vowels. Short vowels are on the unshifted state, long vowels on the Shift state and half-vowels on the AltGr state (Right Alt key, or Left Shift + Left Alt). So 'a' = patach, Shift+a = qametz and AltGr+a = hateph-patach. 'e' = seghol, Shift+e = tsere and AltGr+e = hateph-seghol. 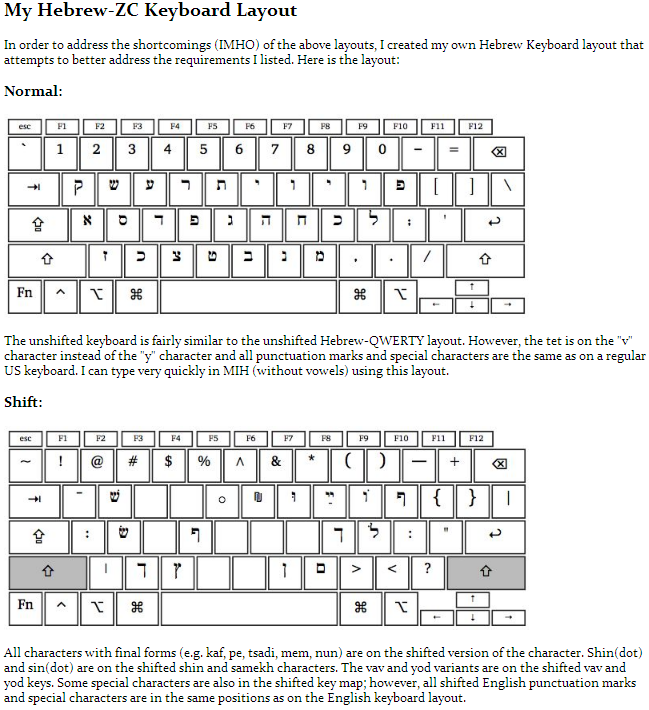 I think that layout is much easier to memorize than many of the alternatives that are more random when compared to the QWERTY keyboard (or not really designed for the needs of Biblical Hebrew like the Israeli keyboard), but I suppose I would, since I designed it. Your cubitage may vary. Extremely nice post. I just came across your weblog as well as wished to say that I have actually liked surfing around your blogs. You can also check this Article, it is really very Helpful!